The impact of 150 years of motoring on our environment is a subject that has been addressed in every issue of the museum’s website research notes since their creation 6 years ago. The latest issue, “The Impact of Motoring”, is now in ebook format. Atmospheric pollution from a cocktail of car exhaust gases and particulate matter (soot) has long been a concern of legislators around the world and is currently a daily headline across much of the UK media. California led the way in vehicle emissions legislation in the 1970s, with the adoption of catalytic converters marking the start of a phasing out of leaded petrol. 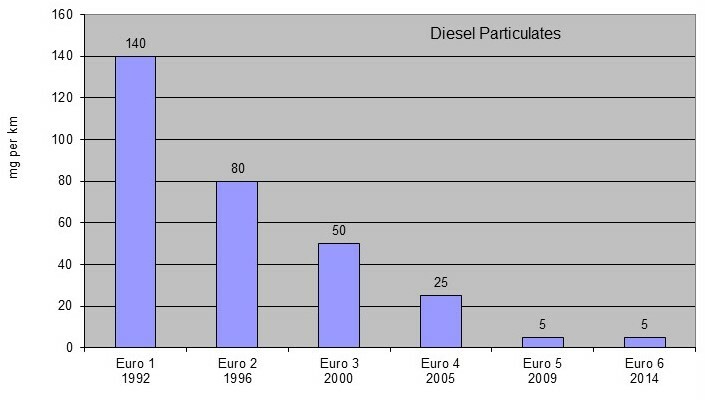 Limits to gaseous and particulate emissions in Europe were specified in 1992 in a directive frequently abbreviated to Euro 1. Currently car manufacturers need to meet the requirements of Euro 6 before they can offer cars for sale in the European market. 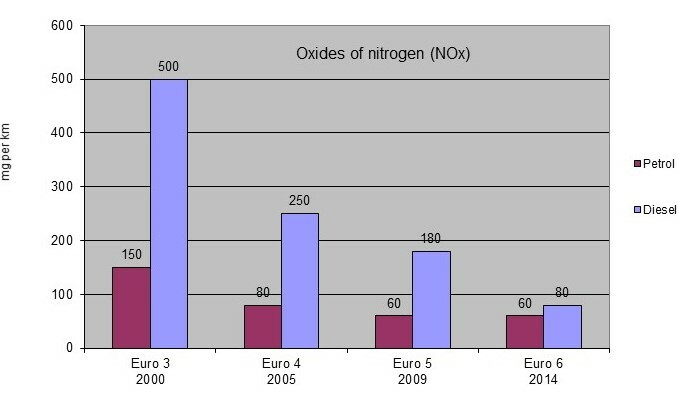 In two areas, emissions of particulate matter and oxides of nitrogen, both particularly relevant to current media attention, the progression from Euro 1 to 6 is shown in the charts below. The left hand scale is in units of milligrams per kilometre driven. Two points to note from these charts: firstly significant reductions in emissions have been legislated at each stage of the directive and, secondly, the transition from Euro 5 to 6, covering NOx emissions from a diesel powered car, represents a significant step. One that has challenged manufacturers who are all keen not to compromise performance nor add to production costs. New vehicle type approval is a requirement for selling in the European market and this is only granted once manufacturers have demonstrated compliance with the relevant directive: since September 2014 this has been Euro 6. A great deal of the recent publicity surrounding emissions from diesel cars has focused on the difference in emissions performance between the standardised regime used during compliance testing and real world driving conditions. Independent tests have shown many real-world performance figures to be in excess of the legal limits by a significant factor. So, one issue facing legislators is how to make the testing regime more accurately reflect realistic driving conditions. In the short term this may even see the legal limits increased above the idealised Euro 6 levels. One argument proffered in the current debate is that even if the modern diesel is more polluting under real-world conditions than required by law, it is still a lot better than the diesel engine of 15 or more years ago. Sadly, the counter to this argument is that over the last 15 years the UK use of diesel powered cars has increased from 12.9% to 36.7% of the total number on our roads. Undoubtedly, there is still more of the media story to unfold: all manufacturers face a similar struggle to affordably comply with demanding legislation and suppliers of electronic engine management hardware and their software developers usually have more than a single motor manufacturer customer. To return to the museum website, the final section of our ebook looks to the future of motoring and acknowledges the environmental implications of diesel powered transport. It also looks at what may replace it!